On January 27, 1871, a forty-year-old congressman from Kentucky sought recognition on the floor of the United States House of Representatives. 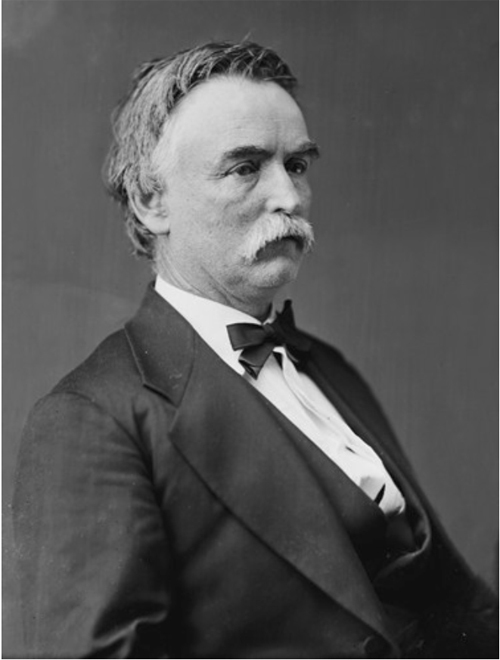 Upon being recognized by the Speaker, the Honorable James G. Blame, the congressman expressed dissatisfaction with the amount of time he had been allotted on past occasions and so requested, and was granted, one full, uninterrupted half hour to speak his mind. The congressman was a Democrat, an able lawyer, ambitious, learned in the classics, and generally well liked by his colleagues. He also had a name that seemed designed especially for being chiselled in stone or signed with a flourish on documents of state. His name was J. Proctor Knott. Still, despite all this, J. Proctor Knott was little known outside Kentucky’s Fourth District or the cloakrooms on Capitol Hill. In the next half hour, however, addressing himself to an obscure bill then before the House, he would change that. He would take up the question of whether federal lands ought to be given to the St. Croix and Lake Superior Railroad m order to build a new line that would run from Hudson, Wisconsin, on the St. Croix River to Superior, Wisconsin, located at the western end of Lake Superior and, as it happened, close by a scraggly Minnesota village of some three thousand people, called Duluth. Congressman Knott’s speech would be filled with faulty facts and bad logic. But no matter. In an age of elaborate and energetic oratory it would be talked about, printed and reprinted, quoted and misquoted, for years to come. According to the Congressional Globe, Knott was interrupted by “laughter,” “great laughter,” “roars of laughter,” and “shouts of laughter” a total of sixty-two times. Once he had finished, the bill for the railroad was as dead as it could be, and he had made famous, by mistake, little Duluth, which the railroad never meant to put on the map in the first place. The speech immediately appeared in newspapers the country over and was published separately numerous times by private individuals. For several years it was handed out as a memento in the dining cars of the Northern Pacific Railroad. In the 1800s, by which time Duluth had become a city of thirty thousand people, the chamber of commerce published the speech to show that what had once been said “in ridicule and derision” had turned out to be facts “in reality.” By the turn of the century the speech had appeared in at least three anthologies of American oratory. Mathew Brady’s portrait suggests that Knott may have had difficulty eclipsing almost anyone. It was also charged, years after the speech, that Knott had had a ghost writer. The “evidence” was only that Knott never gave another speech that was anywhere near so funny. But if one were to judge Knott by the Duluth speech alone, which seems fair enough, his name deserves a place m history. It is also intriguing to imagine how he might eclipse some of the congressional spellbinders of our own day. After you have read his speech, imagine, for example, how J. Proctor Knott might address himself to the proposition of going to Mars or to the building of an S.S.T. There is every chance, of course, that he would be as mistaken about them as he was about Duluth; but certainly what he ould do for the human spirit would be as welcome now as it was that January day a hundred years ago. Years ago, when I first heard that there was somewhere in the vast terra incognita, somewhere in the bleak regions of the great Northwest, a stream of water known to the nomadic inhabitants of the neighborhood as the river St. Croix, I became satisfied that the construction of a railroad from that raging torrent to some point in the civilized world was essential to the happiness and prosperity of the American people, if not absolutely indispensable to the perpetuity of republican institutions on this continent. I felt instinctively that the boundless resources of that prolific region of sand and pine shrubbery would never be fully developed without a railroad constructed and equipped at the expense of the Government—and perhaps not then. I had an abiding presentiment that, some day or other, the people of this whole country, irrespective of party affiliations, regardless of sectional prejudices, and “without distinction of race, color, or previous condition of servitude,” would rise in their majesty and demand an outlet for the enormous agricultural productions of those vast and fertile pine barrens, drained in the rainy season by the surging waters of the turbid St. Croix. … Now, sir, who … who that is not as incredulous as St. Thomas himself, will doubt for a moment that the Goshen of America is to be found in the sandy valleys and upon the pine-clad hills of the St. Croix? Who will have the hardihood to rise in his seat on this floor and assert that, excepting the pine bushes, the entire region would not produce vegetation enough in ten years to fatten a grasshopper? Where is the patriot who is willing that his country shall incur the peril of remaining another day without the amplest railroad connection with such an inexhaustible mine of agricultural wealth? Who will answer for the consequences of abandoning a great and warlike people, in possession of a country like that, to brood over the indifference and neglect of their government? How long would it be before they would take to studying the Declaration of Independence and hatching out the damnable heresy of secession? How long before the grim demon of civil discord would rear again his horrid head in our midst, “gnash loud his iron fangs and shake his crest of bristling bayonets”? Hence, as I have said, sir, I was utterly at a loss to determine where the terminus of this great and indispensable road should be, until I accidentally overheard some gentleman the other day mention the name of “Duluth.” Duluth! The word fell upon my ear with peculiar and indescribable charm, like the gentle murmur of a low fountain stealing forth in the midst of roses, or the soft, sweet accents of an angel’s whisper in the bright, joyous dream of sleeping innocence. Duluth! ’Twas the name for which my soul had panted for years, as the hart panteth for the water brooks. But where was Duluth? Never, in all my limited reading, had my vision been gladdened by seeing the celestial word in print. And I felt a profound humiliation in my ignorance that its dulcet syllables had never before ravished my delighted ear. I was certain the draughtsman of this bill had never heard of it, or it would have been designated as one of the termini of this road. I asked my friends about it, but they knew nothing of it. I rushed to the Library and examined all the maps I could find. I discovered in one of them a delicate, hairlike line, diverging from the Mississippi near a place marked Prescott, which I supposed was intended to represent the river St. Croix, but I could nowhere find Duluth.